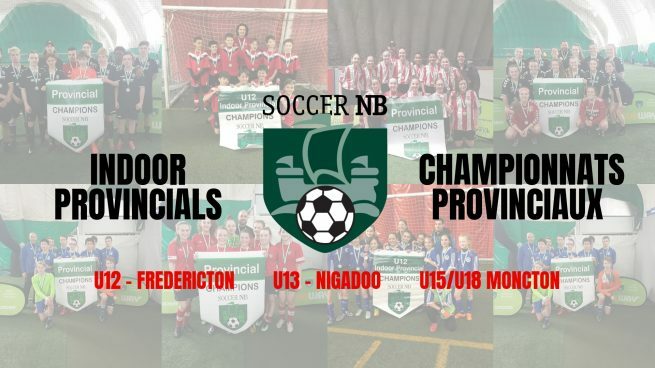 The 2019 Soccer New Brunswick Indoor Provincials will take place on April 6th & 7th, 2019 at the Sports Dome in Moncton for the u15 and u18 divisions, the UNB Dome for the U12 divisions, and at the Indoor facility in Nigadoo for the under 13 divisions. To register, please complete the following form. Cheque ($320) to be made to Soccer New Brunswick. U13 – Nigadoo Schedule: Now available! U12 – Fredericton Schedule: Now available! U15/U18 – Moncton Schedule: Now available!